Hello my lovelies! Another week has passed and it's finally the weekend. This week has been pretty quiet so I got a bit of rest and feel ready for some nail art. I won't be celebrating anything today, just doing nails and watching movies. Since everyone is posting Valentine's Day nail art, I wanted to post something a little more girly than usual. I've been wearing this manicure all week and haven't removed it yet, even though it looks pretty beat up by now. I must say that I enjoyed it a lot! After doing a couple of snowflake sandwiches, I needed a new idea for a jelly sandwich. Finally I decided to use dots to sandwich between the jelly layers. I don't have many jelly polishes so I try to switch it up a bit by rotating the ones I have. This time it was the turn of my bright coral jelly called OPI Big Hair...Big Nails. The problem with this polish is that it photographs totally off. So I had to alter the photos a bit to make them look more true to reality. I also took some photos with my old camera and you can see them below. The quality isn't as good but the nails look pretty color accurate. 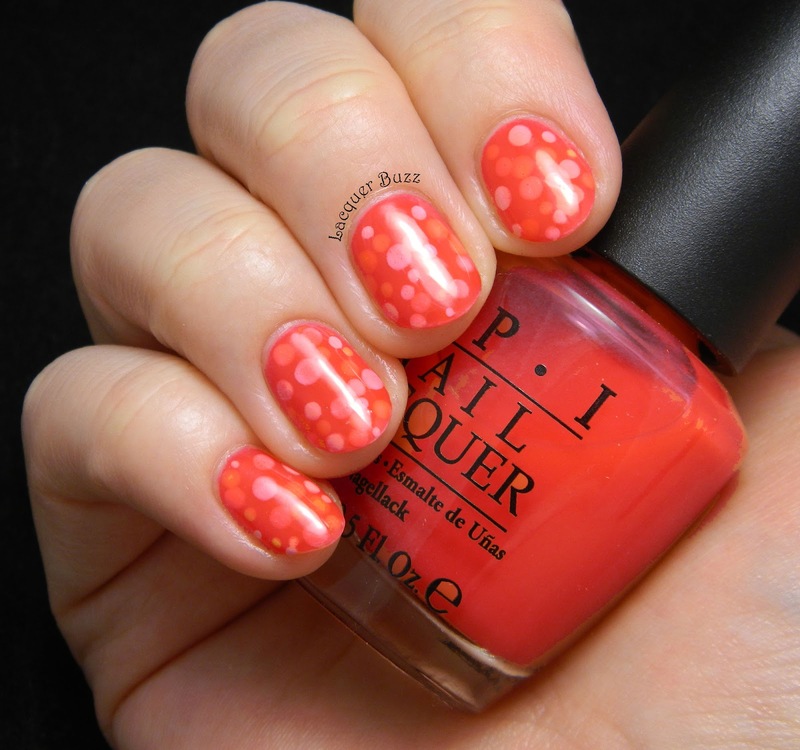 To create these I used a dotting tool to do random sized dots between the jelly layers. The polishes I used for the dots are as follows: OPI My Boyfriend Scales Walls (off-white), Kiko 355 Canary Yellow and China Glaze Feel the Breeze (pink). This is one of those manicures that is hard to explain to people from outside the nail polish community. I tried to do it this week and wasn't successful. But it looks great and I think they can see it too, even if the technique remains a mystery to them. I surely loved these nails and I hope you do too! Have a great weekend! This is so cute! I don't create much jelly sandwiches but I really should since they look so neat! I'm a huge fan of mani sandwiches but this one is amazing! I have never seen even a similar to this! love it! Love it! Arata fantastic si te binedispun. Super faina ideea ai avut cu astea. Si oja e ft frumoasa.